This arrangement of posts is what prompted me to wonder what it was for. What are those new contraptions in Albany’s Takena Park, I wondered as I was riding past and saw them from the street. Four posts each, with connecting stringers at the top, like big four-poster beds. Two of these structures have been constructed at Takena, and similar ones are being installed in Lexington and Gibson Hill parks as well. 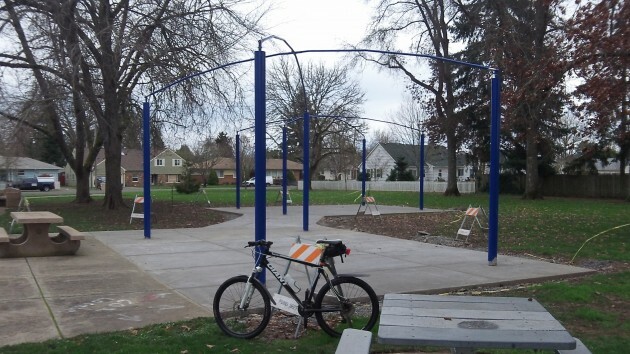 Hodney says the project was identified in the last Parks Master Plan and in several subsequent updates of the city’s capital improvement program. At Gibson Hill and Lexington, money for the additions came from parks systems development charges, and at Takena from the parks fund itself. Do they have any idea what wind speed it can tolerate? The poles seem like they are secure enough, judging from the photos. So it is just what the fabric can bear. You are correct though, that it can be a concern in the Fall, but should be good through the summer. Taking them down also saves the winter wear-and-tear and should make them last longer. Although in my experience, the sun does more damage to fabric than the rain. By the way, we learned this though experience. We have light poles and light fabric over our driveway to keep the our cars cool, as we do not have a garage. I didn’t take them down in time the first fall they were up. My (very nice) neighbor knocked on my door during some Fall winds to let me know my pole had been twisted by the wind, broken, and the entire contraption was now banging against the side of his house! I quickly took took care of the tangled mess. I really appreciate having such a nice neighbor, who found it rather funny and had a good sense of humor about it. I had to put in new poles the following summer. Ever since then, we make sure to take down the covering before the fall storms.